Almost everyone loves doing things with their friends and family on the weekends. It provides a great way to spend time with the people you care about, it provides memories that you can look back on fondly in the coming years, and it easily beats out sitting at home and watching television. But there is one downside to enjoying a ballgame, a concert, dinner at a restaurant, or any other event that takes place in a crowded area: eventually, you have to use the restroom. To some, using a public restroom does not seem to matter all that much, and good for those people. But most of us cannot help but notice that after a huge group of people, not all of whom are sober, have been frequenting the restroom for a couple of hours, they tend to become a bit unsanitary. And those are the clean ones. Most establishments take some measures to provide restrooms for their patrons, but there is only so much that can be done. One of the easiest ways that places can help their patrons out is by providing disposable toilet seat covers for public restrooms. They are simple items that can go a long way when it comes to how people view your establishment. Nobody expects a public bathroom to be as clean as their bathroom at home; it just is not feasible, and people understand that. But they do expect some reasonable measures to be taken to accommodate patrons. And you can believe that the easiest way to get bad reviews – either online or by word of mouth – is to have filthy restrooms. At Brill Hygienic Products, we understand these concerns from business owners. That is why we work hard to create the products that can make a noticeable difference at your place of business. We offer many disposable toilet seat coversdifferent products, including wholesale sanitary toilet covers and automated toilet seat covers that serve as replacements for huge quantities of disposable toilet seat covers. 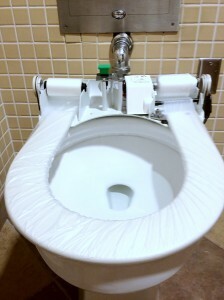 These automated covers are used once and then automatically cover the toilet seat after each use, creating an easy and effective way to reduce the risk of contact with any germs for your customers. Whether you need toilet seat covers for a restaurant, hospital, office building, or any other public restroom, we here at Brill want to help you keep a clean and sanitary workplace. We work hard to ensure that our products will meet the needs of our clients. We have a long history of providing excellent products and service, and we take measures to adhere to the high standards that we have set for ourselves. Our reputation means something to us, and that is why you can count on us to fulfill your company’s needs regarding disposable toilet covers. Why Use Brill Wholesale Sanitary Toilet Covers? All of our products are manufactured here in the United States. We only use materials of the highest quality because we strive to deliver a noticeably superior product. We also adhere to very strict standards for quality, meaning that you can rely on any and all Brill Hygienic Products to live up to their intended use safely and effectively. Also, because we manufacture our own materials in our own facilities and have our own distribution centers, we are able to save our customers money by avoiding expensive costs associated with shipping and other aspects of many manufacturing industries. Regardless of what kind of business you run, we know that you want to provide the best possible experience for every single person that visits your establishment. There are many aspects of that experience, but one that customers will surely not overlook is having sanitary public restrooms. Brill Hygienic Products offers a line of wholesale sanitary toilet covers that you can put in your restrooms that will be sure to provide your customers with a germ free environment. We have been in this business for a long time, and we have plenty of customers who understand the quality that goes into the products we sell. We have a reputation for excellence, and we want the opportunity to prove it to you. That is the Brill Hygienic Products difference.